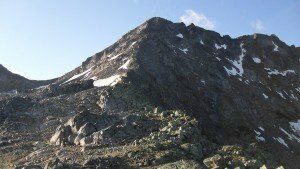 Fluela Wisshorn (Flüela Wisshorn, 3085 m) raises above Fluela pass (2383 m) at its north-east side. 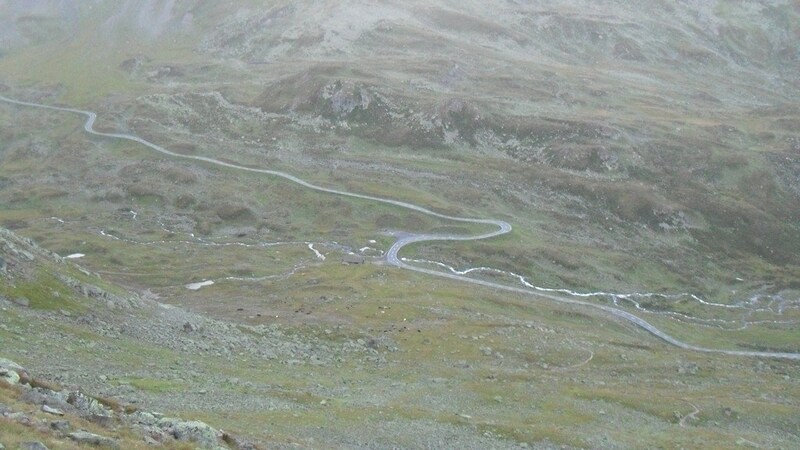 It is very close to an attractive mountain road which connects Davos with Engadin valley in Switzerland. Here I give information on how to climb it. 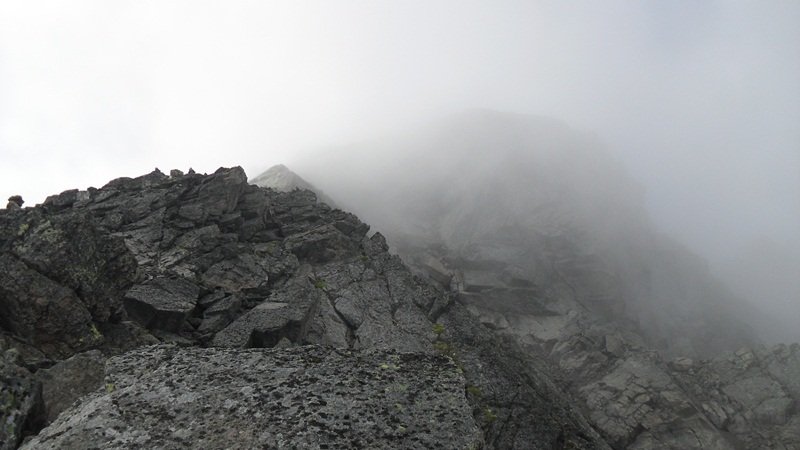 The most direct way to start the climb is from Wägerhus (2207 m) which is below the pass in the direction of Davos. But you can also walk from the pass by following a path along the east side of the road, in the direction of Wägerhus. In both cases, there is a lot of free parking space around. When you are at Wägerhus you should follow the signs to Winterlucke pass which is at the altitude of 2787 m, and in the east direction. 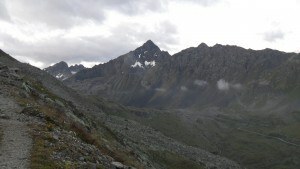 This part is a rarely pleasant walk, with nice views all the time in the direction of Davos and the nearby Flüela-Schwarzhorn, a sharp peak that rises directly above Flüela pass in the south direction. View from Winterlucke pass, 2787 m, and beautiful glacier lakes. Imagine the moment of solitude here in such an early morning. From the Winterlucke pass you will have some simple scramble along the ridge which is in the southeast direction. It will lead you to the summit. 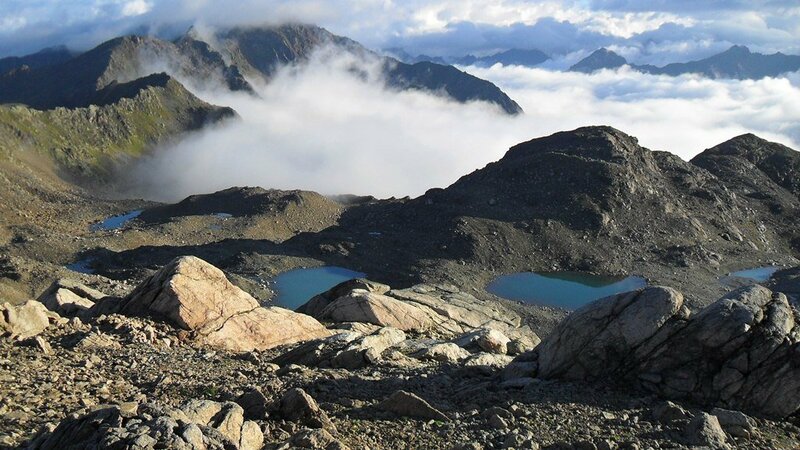 From the ridge you will enjoy views of five beautiful glacier lakes (Jöriseen), see the picture above, which are on the north side of the ridge. 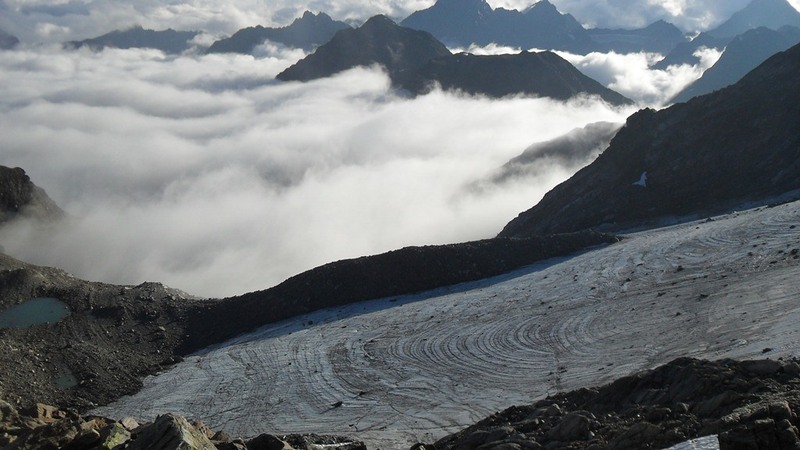 Another attraction is a small glacier Jörigletscher. 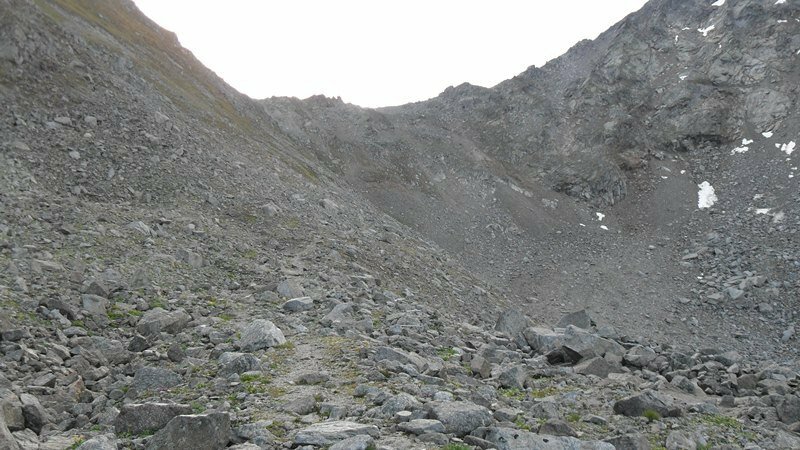 In general, you will need no special equipment to climb this mountain. The route is simple and orientation is no problem at any point. 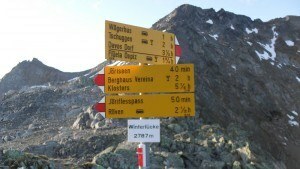 It will take you around 2 hours and 40 minutes in total, this implies 1:40 from the Wägerhus to Winterlucke and then 1 hour more from Winterlucke to the summit. 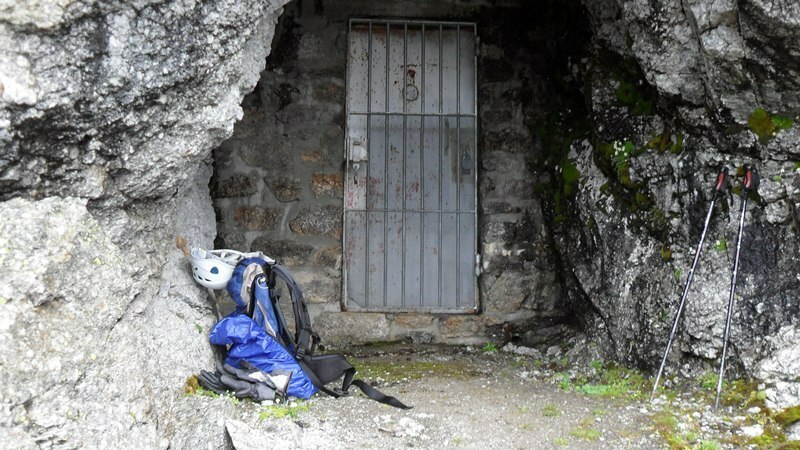 The start point of the route to Fluela Wisshorn. View back toward the road. 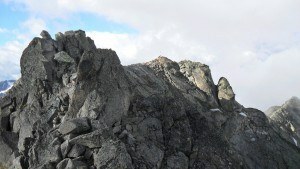 At the beginning of ridge route. View of the ridge still without clouds. For me, this was a solo tour from the parking at the Wägerhus where I spent the night sleeping in the car. My timing was this: started at 5:35 am, arrived at Winterlucke at 7:15 and to the summit at 8:15. The weather was good in the beginning but at the ridge section clouds started coming and it was raining when I was at the summit. The ridge route back to Winterlucke pass became more difficult. The water was running everywhere around over the rocks which became slippery. There were no other people on the mountain that day, I guess they knew the weather forecast for the day. Well, I can only say they missed a lot. So, for me, this was a solo tour in an exact sense. Here I took a rest enjoying watching the rain, some military installation from WWI. I did not mind the rain. I never do. I read somewhere a statement by somebody who knows much more than me about mountains: There are no bad weather conditions, there is only bad equipment. 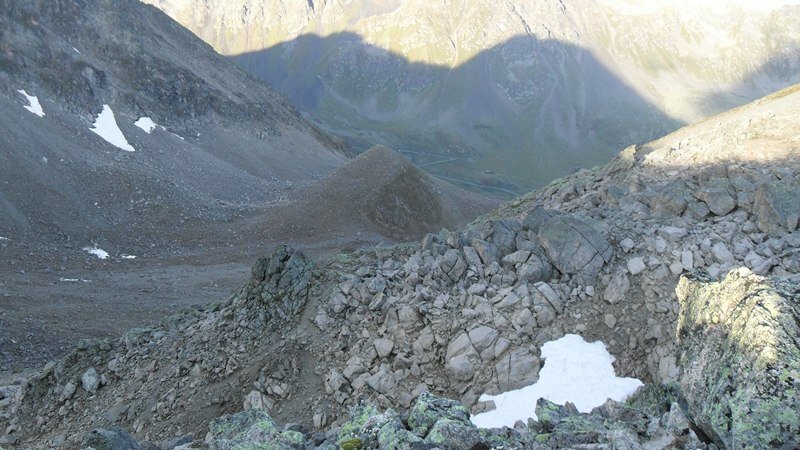 You might want to see my text about Fluela Schwarzhorn which is on the south side of the pass. Please leave your comments below. I shall be happy to answer any question you might have. If you need accommodation in this part of the Alps, please visit my page about several reliable agencies which I myself have been using many times in the past. Im originally from colorado so reading about this mountain was extremely entertaining for me. I love how you wrote and divided this page. It seemed like i was hiking the mountain myself while reading this. The use of maps and photographs from the right angels really made me feel like i was there. Thank you Spencer, it is great to hear that you could really visualize the route and the mountain. That was a great day, rain in one period but this did not matter. 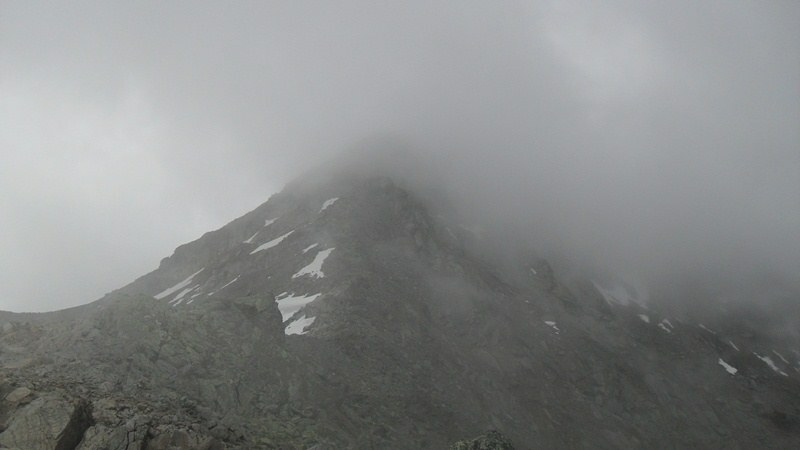 You have seen the pictures, the weather was changing all the time and I enjoyed it, had the mountain for myself. Thank you Deana, I shall bear your remarks in mind, much appreciated. There is so much information on this site! 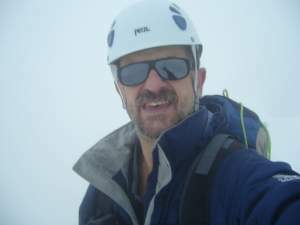 I love how you start from the beginning and reach out to those who have never tried mountain climbing before as well as digging into the different equipment and equipment reviews. This site makes me want to take the wife out and climb our first mountain! Hi Tyler, very kind words, and man: do it, try it. If you decide it is not for you then fine, but it is worth trying. Life would not be worth living without mountains for me. Thank you so much. 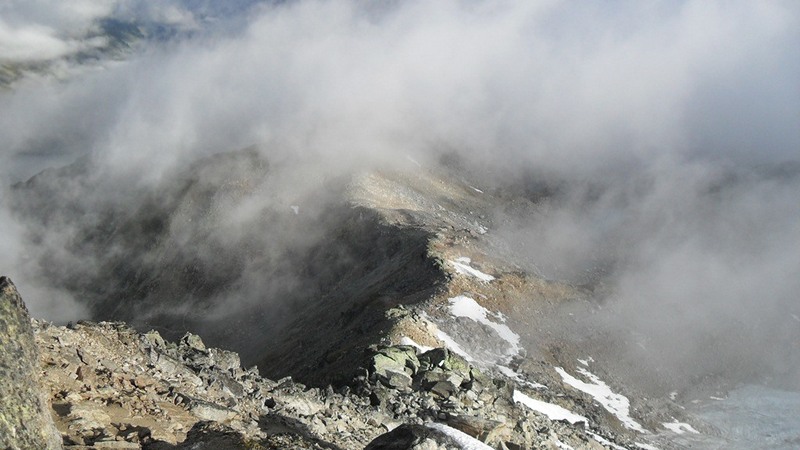 Mountain climbing is an amazing activity and hobby. I currently haven’t been on a good mountain climb in a long time. However, looking to plan and complete a big on about once per year. I know Switzerland is an amazing place for mountain climbing and hopefully I’ll be able to climb there one day. Where would you recommend climbing in California? Hi Luke, thank you for visiting my site. I am afraid I am not familiar with mountains in California. Fluela Wisshorn looks like a very nice hike. One of the things I like to do most is go hiking. Thanks for including all the pictures. That makes is very simple to see the route and plot my course. The ww2 site looks like it could be a very interesting place to visit. Hopefully one day I can go. Hi Bryan, thank you for visiting my site and for the time to write this comment, this means a lot to me. This site has some of the beautiful photos. I thank the author for such a feast to my eyes. I would love to read some of the experiences like where to stay nearby, transport, food etc., for other travel enthusiasts like me. What is the best time in year one can visit this place? Hi RightKarma, thank you for visiting my site. I understand that you did not find all information which might be of interest to you. 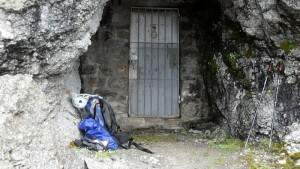 But this is site about climbing, not about tourist information. You have some keywords there like Davos, that should be enough to search further. Regarding accommodation, you have a link in the text. As for the best period to visit this place, definitely summer. 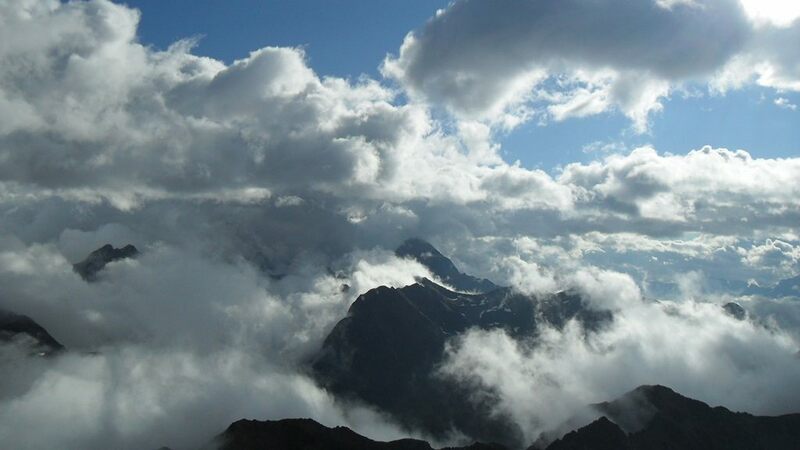 This is the only period for climbing mountains in the Alps, they are covered by deep snow in winter time. I was there once in January, this is only for skiing in winter time. You know for me mountains are my origins as well. My community is living on mountains and building their houses on mountains. I come from, Kabylie, a north African region (Berber people) who are the native people of north Africa. Mountains are amazing and protect us and we believe that the wind makes us feel free, we are very generous people and very tolerant but we don’t like injustice. I am proud to be the son of the mountains and I am proud to be a free man. Hi Juba, great to read your comment. I like how you feel about mountains, the same is at my side. Many thanks.